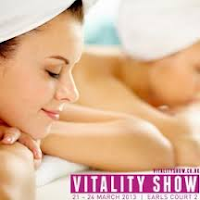 The Vitality Show has everything you need to look and feel healthier, fitter and more gorgeous than ever before. We all want to shape up, get healthy and feel confident but it can be tricky to know where to start. Rather than spending time and money researching fitness classes, activity holidays and healthy recipes, why not get all the advice you need under one roof at the Vitality Show? The Vitality Show has fitness experts on hand to help unearth your perfect exercise regime, therapists to relieve tension with relaxing massages, and nutritionists to teach you how to add nourishment to every bite. 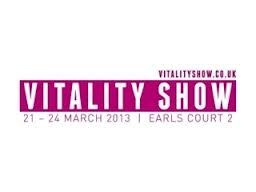 The Vitality show is being held at Earls Court 2 in London from 21st - 24th March. I am really excited to attend this unique show in the UK...and I am sure you are too...well, you're in luck ! I am very happy to announce that the lovely people from The Vitality show has teamed up with Jagruti's Cooking Odyssey and generoulsy offered 10 pairs of tickets to our readers who wish to attend this show in London. Enter our competition and you could win a pair of tickets to the show! Leave a comment on this post saying who will acompany you to this show, then gain more entries via Rafflecopter. If you're not a blogger, you can still enter this competition. Leave your comments as anonymous but put your name down in the comment box and carry on with the rest of the entries. You must be over 18 years of age and provide a valid email ID, so you can be notified for your win. The winner will be picked at random using software and then contacted by email, so check your emails and your spam! THE GIVEAWAY CLOSEs 8 AM ON 18th March 2013. So grab your girlfriends, pick up a glass of champagne and book your places for the ultimate feel-good event, the Vitality Show! I would love to come - and would take my Mom. Great Mother Daughter Bonding time. My lovely daughter who is getting married this summer. I would love to come and I would bring my sister! I would go with my with sister-in-law and have a fun day out. I would love to take my daughter with me, we try to go every year and travel from Liverpool especially!